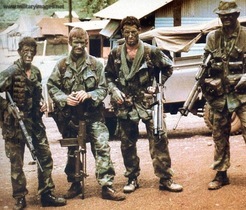 The SASR are Australia's best known and most elite special forces. Their selection process is the most arduous of all, and it is hands down the most difficult to get into. Below are some useful links and a brief overview of training and selection for the SASR. SASR candidates must complete nearly 18 months of training before being allowed to wear the regimental beret. Building a soldiers skills from the ground up, the reinforcement cycle consists of courses in basic patrolling, SF weapons, parachuting, combat survival, signaller/medic, heavy weapons, demolition, method of entry techniques and a 6 week long urban combat course. A keen eye may have spotted the nearly verbatim similarities in Commando and SASR training. While this is so, SASR troopers have compulsory training in all three Commando specialties (sigs/medic/demo) as well as some of the optional advanced courses that Commandos can undertake. Moreover, some of the SASRs courses are longer than commandos, like the Urban Combat course for example. While this reinforcement cycle is considered the troopers employment training, it is also, in a sense, part of selection since one can be dropped at any time for failing to meet the requirements. If you wish to become an SAS trooper you can come from any corps in the Army, Navy or Air Force. Most of the candidates will come from Infantry, however navy clearance divers and airfield defence guards (RAAF) have just a good of chance as the infantry, and Commandos an excellent chance should they want to join another SF group. To join the SAS you cant just wake up in the morning and decide you want to join just for something a bit different. You will probably find that most people serving with the SASR don't do it for the money, they do it for the excitement and challenge. Preparing yourself for the arduous selection course can take weeks, but a lot of people have been preparing for months or even years to meet the high standards. The Army has released training programs for prospective Commandos and SASR soldiers which can be found in the News/Info section of this site. The regime runs up to 13 weeks long - its well worth the effort as instructors can quickly spot who has and hasn't put in the effort. Before contemplating trying out for the SASR it would be wise to consider if one is a team player and yet has the ability to work independently, if you are extremely physically and mentally fit , a lateral thinker, have an inordinate amount of self discipline, are efficient in all infantry skills, and posses a keen desire to learn. Soldiers who wish to join either Commandos or the SASR must appear before a pre-selection board composed of officers and senior NCOs. Prospective recruits have essentially two hurdles to pass. The first is the Special Forces Entry test, which both Commandos and SASR applicants must pass. The entry test is run over the course of 2-3 days and recruits are subjected to an intense regime of exercises and little sleep. If recruits pass the SFET they are then interviewed by a Selection panel who will assess whether or not the applicant has the qualities that the SF groups are looking and which would allow him to excel at his job. Once interviewed by the selection board, they are told to report at a specific time, when the next selection course will be conducted - Commandos will then report to Commando Selection and SASR applicant to SASR selection at Swanbourne barracks, WA. The Army News recently ran an article in which a senior NCO was quoted remarking on the selection course by saying "You know, it's actually only 17 days of assessment in total, if you allow for travel,". During the course the candidates will be put into extremely stressful conditions. The candidates will be required to do lots and lots of running carrying a range of different weights plus webbing and a rifle, they will do countless amounts of situps and pushups, after a few days of the course the candidates will find themselves sleep deprived, every muscle will be burning, they will have blisters on there feet. This is the time where the mental toughness has to kick in to keep going. The candidates will have to push themselves to the limit and in most cases this is not enough to even get through the first week of the course. The candidates will be required to swim in both warm or cold conditions to the point of extreme fatigue, run 14.4km in 90 min, run 32km in 5 hrs, in either a group or an individual task. Keep in mind that these runs can be conducted first when you’re all fresh or at week 4 when you have blisters all over your feet with no toe nails. There will be unexpected exercises, the candidates may find that they can get a 3 hr rest, and in the first 10 min the senior instructor will tell everyone to get up, go for a 5 km run, there will be a truck waiting for you, then when they reach 5km the truck drives off, and they are asked to run another 5km, some candidates quit right there, the rest that continue may find that the truck is only 1 km away. This is called a sickener, its mainly to give you the idea that you should not even be trying the course. A lot of the course requires a lot of fitness however you do have to know how to navigate yourself through any terrain with not so good maps and a compass, and again, this may sound easy but try doing it when you have had 4 hrs sleep in 4 days in pitch black in the middle of nowhere. The candidates will also be put under interrogation resistance training, this is a critical part of the course, as the interrogators will try to trick you into leaving. They may ask you to sign a form saying you have passed the course, or they may just say " congratulations you have passed" and leave you in the room to see if you walk out. The only way they will know that the interrogation is over is when they get taken out of the room and have the wet hessian bag taken off their heads and taken for a cup of tea. It is really heartbreaking for the candidates when the senior instructor comes up to them and says "sorry you’re not what we are looking for" especially if it is near the end of the course. You get 2 chances to try selection, maybe 3 if your were injured, but that's it. The candidates may feel disappointed if they don't pass, but if they look at it from an optimistic point of view they will see that they have accomplished a lot just buy trying it.